New Hampshire is a small state in the New England region of the USA. It is also called the “Granite State”, because of its extensive granite formations. The two most known mottoes of New Hampshire are: “You're Going to Love it Here” and “Live Free or Die” and frankly they express quite well the nature of the state and spirit of its inhabitants. New Hampshire was the first to declare its independence from the Mother England. The state has large mountains on the East Coast, with lots of opportunities for recreational activities such as skiing, snowmobiling and other winter sports as well as hiking and mountaineering during spring-fall season. You can find here some rare species such as the karner blue butterfly, lynx, bald eagle, short nose sturgeon, Sunapee trout, Atlantic salmon and the dwarf wedge mussel. Newfound RV Park has 38 large, flat gravel sites and 6 brook-side sites; all of them have full hookup service with cable TV and WiFi. All the sites have a picnic table and fire ring. The park has clean, private bathrooms with showers and laundry room. On the site there is also a camp store with ice, firewood, coffee, tea and some other supplies. The covered pavilion with ping pong and pool tables, offers the chance for indoor activity in the case of rainy weather. You can bring your kids and pets along: there is a playground with a large sandbox and an enclosed dog park. Some of the closest attractions are for example the Pristine Newfound Lake and the Profile Falls. If you want to enjoy the wilderness, the closeness of nature and the healthy fresh air, but all in the comfort of home-like environment then this is a great place to park your RV. There are over 125 wooded and brook-front sites with full hookups and 20, 30 & 50-amp electric service. There is free Wi-Fi on the campground, picnic table & fireplace at each site, modern restrooms, store with most important things you may need, laundromat, ATM, RV dumping stations…. The park is surrounded by the National Forest; it is also right next to Lost River and Walker Brook. Pets are welcomed but they need to be kept on leash. 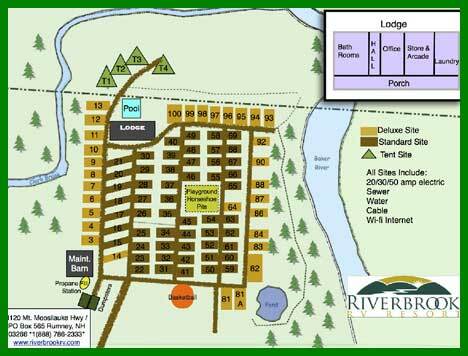 Riverbrook RV Resort is located in the area of lakes and rivers so guests can enjoy water sports. The park has a heated in-ground pool, propane fill station, game room, laundromat, general store, basketball court, playground and other facilities. RV Resort offers pull-thru and back-in sites with water, sewer and 30/50 amp electric hook-ups as well cable TV. The area offers plenty of hiking trails, rock climbing places, biking trails as well as and several golf courses. If you like canoeing, kayaking, boating or fishing then nearby Baker River, Pemigewasset River, Stinson Lake, Newfound Lake, Squam Lakes and Lake Winnipesaukee just wait for you. Nearby attractions worth to visit are: like Polar Caves, Clarks Trading Post, Hobo Railroad and Lost River Gorge . If you want to visit the White Mountains, Lakes Region and the New Hampshire Seacoast, you can stop at the Sandy Beach RV Campground. All of these beautiful places are quite close to the park. RV Campground sites are spacious and secluded; some have waterfront locations. The campground has laundry facilities. 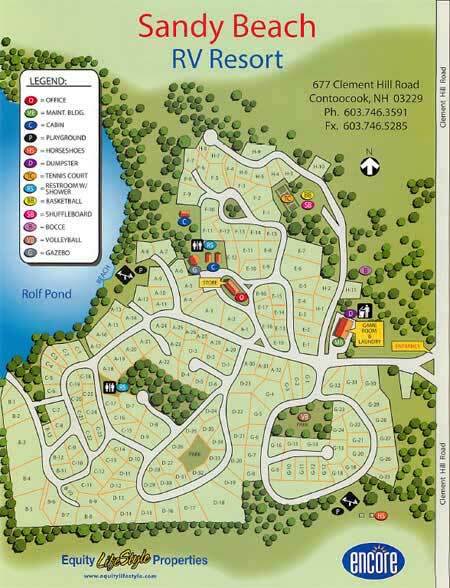 Given its surroundings, campground is a great getaway for weekday & weekend activities for adults, teens & kids. It is paradise for fishing due to the abundance of fish in the lake: large and small mouth bass, yellow perch, rock bass, blue gills, sunfish….. You can bring your canoe, paddle-boat or small row boat along, and enjoy your day floating on the beautiful lake. The Hidden Valley R.V. & Golf Park is located on 800 acre outdoor recreation area. The campsites offer privacy; each has water, electric and sewer hook-ups and picnic table. On the premises you will find LP gas, wood and fireplaces, modern restrooms with hot showers and other facilities. There are also two ponds where you can do some fishing as well as the shuffleboard and horseshoes for kids. It is also the paradise for serious golfers - an 18-hole championship golf course and an executive Par 3 golf course are right here. Local attractions include: Canobie Lake Amusement Park, harness racing at Rockingham Park, Museum of Family Camping, Christa McAuliffe Planetarium, America's Stonehenge, Anheuser Busch Brewery and the Nutfield Brewing Company. Finding a campground in New Hampshire might not be as hard as you think. Look at this directory of campgrounds: tent and RV camping parks New Hampshire (NH) for a few ideas that might turn into return trips. You will want to see the Indian Head rock profile and the George Washington rock profile. These attractions are historical and need to be viewed by everyone visiting New Hampshire. If you travel in your motorhome trailer or with a pop up camper, finding a campground needs to be easy. Take your recreational vehicle such as a mobile home, pop up camper or motor home and seek out a campground using the directory of campgrounds: tent and RV camping parks New Hampshire (NH). If you need some relaxation and great adventures, camping is the way to travel. You never know what to expect, because everything will become an adventure. If a beach camp meets your needs, find one that has sandy beaches and plenty of sun.